In case you didn’t see it already, DesMoinesRegister.com published an interactive map indicating the population changes for each Iowa county as indicated by the 2010 census. Of all 99 Iowa counties, Pocahontas County had the biggest percentage drop — minus 15.6% — in population. Rolfe, Iowa, my hometown, is in Pocahontas County. In my dad’s 1976 Bubbles in the Wine column (below) about population trends, he referred to Pat Wood. 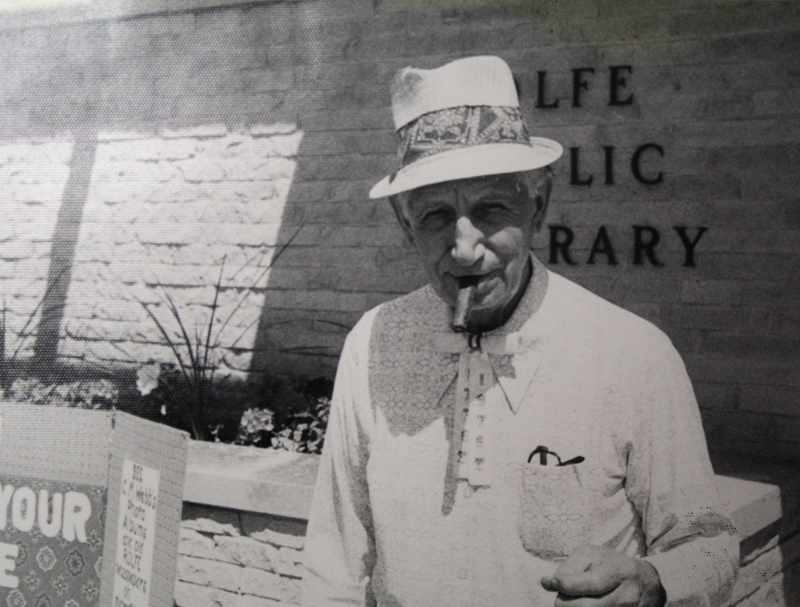 Since Pat was a former mayor of Rolfe and longtime businessman there, I thought it would be fun to include a couple of photos of him. Pat passed away in 1987. Several years ago the Register had an article on the projected population growth of different Iowa areas to the year 2020. The Skunk River valley area — Ames, Newton, etc. — was predicted to have the highest growth (0.45 percent per year). Our area, the Des Moines River valley was predicted to have an increase of 0.35 percent per year. The lowest was southwest Iowa, I believe. I visited with Mayor [Pat] Wood a few days ago. He told me that whereas the town of Rolfe had an official census of 767 in 1970, the population, according to the count taken in February, 1976, was 838. That’s a nice gain and it has been gratifying to see a number of your young people come back to Rolfe as well as others that have moved into town. Projecting from the figure of 838 at the rate of 0.35 percent per year, we come up with a figure of 976 in the year 2020. Or using the 6 year growth rate from 767 to 838 (and assuming it would continue) we would come to a figure of 1359 in the year 2020. We would like to think that if the town did get to one of those figures it would mean that the Rolfe School would have a substantial gain in enrollment. That will probably not be the case as the percentage of old people is increasing, the young ones decreasing. That is substantiated by there having been a school enrollment drop averaging 8 per year for the last 5 years, the heaviest being the last two years — even with the town population increasing as mentioned. The 1976 census shows only 247 people age 0 to 20. The drop in farm population is no doubt a factor also. The influx of population to Rolfe seems to be primarily retiring people and people that are using Rolfe as a bed room town and working elsewhere. The latter is probably the greatest hope that we have to continue to grow some. It seems that we haven’t had much sound interest by anyone in locating an industry here — and apparently the same is true in other towns of our size. It’s easy for me to understand why there hasn’t been a lot of interest in locating industries in smaller towns and why there probably won’t be in the future. This writer attended a meeting in a larger town outside the county several years ago and listened to the executive director of the Chamber of Commerce tell what all they were doing and offering to find industries that might locate there. The extent and the detail of their research amazed me. My feeling ever since that time is that with all the bird-dogging by the larger towns and cities, there would be very little chance of industries coming to the smaller towns. 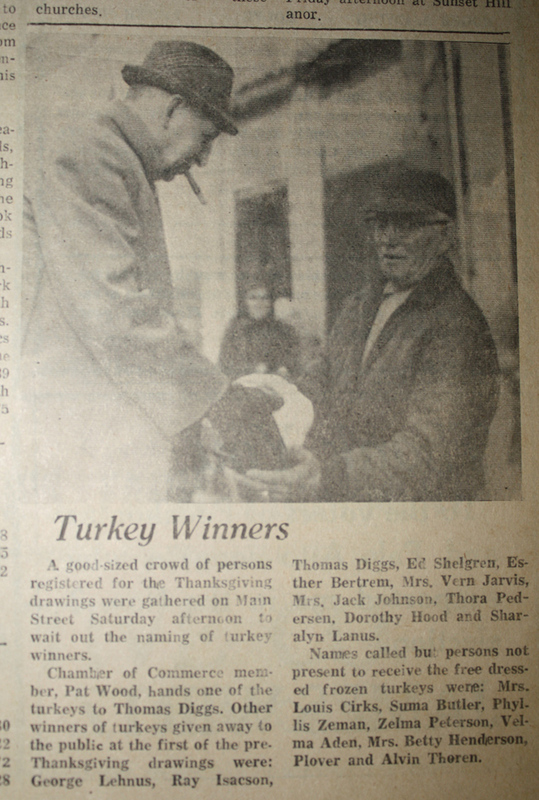 This photo of Pat Wood and Tom Diggs is taken from the November 19, 1970, edition of The Rolfe Arrow. This entry was posted on February 24, 2011 at 11:29 pm and is filed under Bubbles In The Wine, Deane Gunderson, Iowa, Rolfe. You can follow any responses to this entry through the RSS 2.0 feed. You can skip to the end and leave a response. Pinging is currently not allowed. With St. Patrick’s Day just around the corner, it’s fun to read about Pat Woods. St. Patrick’s Day seemed to be his favorite celebration. He went all out for the Green. And so did Harold Calligan, another popular and prominent main street figure (and father of a classmate) when I was growing up. The recent release of Iowa 2010 census figures, especially for Pocahontas County, and Daddy’s projection, based on what must have been an incorrect count in 1976, for Rolfe’s population in the year 2020 bring to mind several thoughts. I recall Mother saying that, for two decades, Pocahontas County had the largest percent decline in population among all Iowa counties. Indeed that’s true. From 1980 to 1990, Pocahontas County’s population declined 16.22%. From 1990 to 2000, the decline was 9.06%. And the latest census shows the same trend: from 2000 to 2010 a decline of 15.61%. At its peak in 1940, Pocahontas County’s population was 16, 266. When I graduated from high school in 1960, the county’s population was 14, 234. Currently it’s 7,310. Although I know the county’s population as far back as 1900, I know the population of Rolfe for only a few years. In 1970 Rolfe’s population was 767; in 1990 it was 721; in 2000 it was 675; and the 2009 estimate was 567. A few weeks ago the Pocahontas Record-Democrat provided information prior to the election to merge the Pocahontas Area and Pomeroy-Palmer school districts. One chart amazed me. In just seven years, the Pocahontas Area district’s enrollment dropped from a little more than 700 to only 500. When I was in kindergarten, my class (Rolfe High School 1960) consisted of 43 students. In eighth grade we had 40. We graduated 33, and that included six from Des Moines Township, one of whom had originally been part of our Rolfe class. That means of the 40 eighth graders, only 28 graduated in Rolfe in 1960. That’s a 30% decrease in four years. Iowa’s rural population has been declining for decades. I’m just one of hundreds of people who grew up in/near Rolfe and moved away. Just one of my five siblings lives in Rolfe. Of the 33 Rolfe 1960 graduates, only one has a Rolfe address. Another lives in Pocahontas County. Of the 40 of us together in eighth grade, 25 live in Iowa. These are just the numbers. For every person who ever lived in Pocahontas County, there’s a story regardless if that person remained in the county or moved elsewhere. Collectively these stories would paint a picture of rural Iowa’s changing landscape.